Office-Politics » Ever wondered what coaching advice CEO’s receive that keep them going at full speed? Ever wondered what coaching advice CEO’s receive that keep them going at full speed? How do CEO’s balance maximum effort at work with demands in their personal life? In this interview with co-author of EXECUTIVE STAMINA, Marty Seldman, we discover some of the coaching tools he uses with his clients (explained indepth in his new book). My favorites are ‘shifts and drifts’ and the three bucket system. 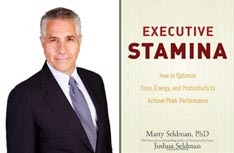 Franke James, Editor & Founder of Office-Politics interviews Dr. Marty Seldman about how to develop ‘executive stamina’. One of the things that struck me as I read Executive Stamina was your presence as a coach in executive’s lives. And that you do not focus just on their business career, but take a holistic approach that touches virtually every aspect of their lives. Has it surprised executives that you consider their personal life, how much time they allot for their spouse or kids, as well as the food they eat and their fitness regime, as a factor in their career success and something that they should talk to you about? It is fairly common that workplace stresses and work/life alignment concerns are close to top of mind for executives I coach. Since each person defines “balance” differently, I guide them to use the Executive Stamina skills and systems to achieve their own stated goals and stay consistent with their values. They intuitively know about the need to maintain energy and enthusiasm so they are receptive to the fitness/stamina discussions as long as they are practical and realistic. The Executive Stamina system is unique in that it combines your expertise as an Executive Coach and Joshua Seldman’s expertise as an Endurance Coach. However, I would imagine that the executives you coach have great demands on their time. Do you get much push-back from executives saying they are too busy to exercise? How do you counter that? We convince them that the payoffs for raising your fitness level are so dramatic that they will save time through clear thinking, better decisions, reducing stress, sustaining focus and better “people” skills. Then we show them many ways to combine fitness activities with other tasks so that being fit requires no extra time. In other words, we give them the “will do” (motivation) “can do” (skills and systems) and then take away all their excuses for not being fit. In Executive Stamina you talk about wanting to give people a system they can use by themselves to monitor and track their own behavior. You tell the story of a friend who expresses a desire to lead a healthy life, but then doesn’t do anything to improve her health. You remark that what she really needs is a good friend who will tell her that her actions are out of alignment with what she says is important to her. Can you tell us how your system can act as that ‘good friend’ and help people live up to their core values? What I have found in my own life, as a clinical psychologist, and an executive coach, is that most of us, at some point, will drift from practices and behaviors that are important to us, and not notice it. This is what we refer to in Executive Stamina as the Law of Gradual Change. We tend not to notice small, gradual changes in our lives. The systems we provide to counter this Law are: alignment exercises to identify the gaps in how your time spent matches your priorities and values, the Minimum systems to slowly, but realistically close those gaps and the Shifts and Drifts tracking system to monitor changes in your life on a regular basis. These are ways to be a good, candid friend yourself to keep yourself accountable to your own goals and the key people in your life. Although most of us are not coaches, I think every reader has, at one time, tried to coach a friend, coworker, or family member to change a bad habit. The person may commit to an action, but actually getting them to change their behavior and develop new habits is very tough. Can you tell us how your ‘Shifts, and Drifts’ system works to solve that dilemma? The Shifts and Drifts system and the alignment exercises are a significant part of helping someone change. They do that by holding a mirror up to how our behaviors match our stated priorities. They put a person in the situation of facing that they said a business priority, or their health, or their financial independence or key personal relationships are very important. Then learning to take control of one’s calendar (prioritizing, scheduling, setting limits/boundaries, learning to say ‘no’, etc) to devote the appropriate time to these objectives. We are all juggling multiple demands, and most of us wonder if there is enough time in the day to do it all. Can you tell us about your ‘three buckets’ concept and how that can help us? Many of the people I coach have grown up hearing the phrase “If something is worth doing, it is worth doing right” from their parents or teachers. While this is helpful advice (to a point) to high achievers it can lead to a type of perfectionism that works against us. With each of us having multiple roles and demands it is very helpful to clarify tasks into three ‘buckets’ and then approach them differently. The three types of activities are ‘nice to do’, ‘need to do’ and ‘need to do well’. “Nice to do’ tasks can be delegated or even ignored (without guilt) if you are too busy. ‘Need to do’ actions have to be done but they can be ‘good enough’, not perfect. ‘Need to do well’ activities should be your main focus and get your top effort. Making these distinctions will reduce your stress and help you make better decisions about allocating your time. The importance of combining activities is something you talk about — and live up to. Co-authoring Executive Stamina with your son, Joshua, is a great example of combining business goals with personal and family goals. Can you give an example of someone you’ve coached who has combined activities to achieve a happier personal and/or business life? There are many ‘combining’ examples I could provide, but it’s critical to understand how combining activities is very different from multi-tasking. When we are multi-tasking we are doing two tasks at the same time (e.g. : listening at a meeting while checking email). Finding your ‘career sweet spot’ is central to the Executive Stamina philosophy. All of us want to be working in that sweet spot. What are the key signs and signals to help us find it? Your career “sweet spot” is a combination of four elements: 1. What you are good at (Competence); 2. What you like to do (Enjoyment); 3. What you are deeply curious about (Interest); 4. What fits with your values (Meaning). To find your sweet spot it is helpful to pay attention to some qualities of your experience as you engage in activities. Energy level – Notice your energy and enthusiasm or lack of. Feedback from people around you about how engaged you are can be useful. Interest level – What are the areas where you have sustained curiosity (e.g. : you ask questions, learn from others, read a lot)? Enjoyment – Have you ever worked long hours, fully concentrating on a task, and when you finished said to yourself, “I should feel tired but I’m not”? These experiences can yield useful insights into what constitutes enjoyable work for you. Daydreaming and Mindshare – Our thoughts often drift in the direction of our needs. Pay attention to your persistent daydreams for clues about your deeper needs. I was impressed by this idea in your book, “Unfortunately, many of us have a tendency to, unwittingly, put very important activities on the ‘back burner’, activities that would actually help us achieve our long term goals.” What advice do you have for people to ensure they get the important stuff cooking on the front burners? Long-term goals may not receive sufficient focus for a variety of reasons. The first is the “tyranny of the urgent”, i.e. a phone call, email, someone standing at our office door, or something grabbing our attention on the web, will most likely divert us. The second is that many of us are already overcommitted and overscheduled. A third, for some of us, is that the project (writing a book or article, financial planning, public speaking) may seem overwhelming or scary. For all these reasons, if we don’t schedule specific sometimes small, steps towards our goal, we are likely to have extended periods of minimal progress. In Executive Stamina you talk about organizational savvy as one of the key skills executives should strive to develop — and that it should be in their ‘best use of time’ category. Knowing that you’ve written an entire book on the topic (Survival of the Savvy), what are the top-line concepts that Office-Politics.com readers should be aware of? Really there are two: Watch out for errors of omission and errors of commission. Errors of omission include not devoting enough time to Organizational Savvy basics: studying power dynamics, networking, effective self-promotion, knowing and managing the “buzz” (how you are perceived), etc. Errors of commission refer to the strong links between stress and savvy. Even the most savvy person, when they are too tired, busy or stressed, will make savvy mistakes. Lack of verbal discipline, using “limbic” (caveman) vocabulary versus executive vocabulary, emotional displays, impulsive decision-making, and “wounding the king” (or queen) can easily undermine your career progression. What advice do you have for Office-Politics.com readers who may need to deal with distracting or toxic people? 30 years ago a psychologist established a very high success rate in his practice by dispensing this simple advice: “Identify two types of people in your life: toxic and nurturing.” “Toxic” people are those who drain your energy, waste your time and wind up leaving you feeling worse about yourself. “Nurturing” people have the opposite effect on you. Spend more time with nurturing people and eliminate toxic people or minimize your contact with them. Applying this advice to our office life would start with noticing the effect certain people have on us. If it is negative and you have tried to improve the interaction with no progress, then politely, but firmly, limit the contact points. This fits with the idea of noticing your energy levels, what impacts them, and takings steps when needed to protect yourself. One of the most important skills we teach in Executive Stamina, and in our seminars and coaching, is the ability to say NO. We call it a “soft no” because we provide the language to protect yourself and your calendar while maintaining your image as a collaborative, helpful team member. Franke James, Editor & Founder of Office-Politics: Excellent advice! Thanks very much for agreeing to this interview. You have developed some outstanding tools that can help people develop the necessary stamina to achieve their life and business goals. If Office-Politics readers are curious how Marty Seldman’s advice can be applied to an Office-Politics dilemma, check out this OP letter. See also Marty’s tips on Seven Ways to Boost Your Executive Stamina. I work for an agency where I make 30,000 annually. My job requires me to be on call 24/7. My morning begins at 6am and does not end until 9pm. Those are the hours that I must have my work phone on and I also have a two-way radio to have communications with the drivers that I manage. I also work at the office from 8-5 just like everyone else does. I do not get any other compensation for the extra time. I cannot even leave for the weekend due to having drivers out on Sat. Should I quit this job? It has consumed my life and is close to ruining my marriage.